Finding the best dehumidifier for the basement and rest of the house can be a tough task. 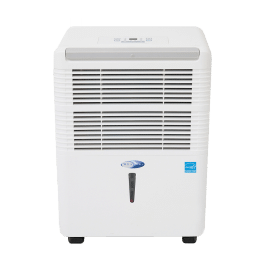 Going through all those dehumidifiers for sale, their ratings, reviews and many other things to get one perfect dehumidifier can take a bit of effort. In an attempt to help you with just the same, we will tell you about DeLonghi DD50PE Dehumidifier in this review. DeLonghi DD50PE Dehumidifier is a 50-pint unit that comes with a built-in pump. The dehumidifier offers a great deal of functionality and flexibility that will suit a range of areas and users. It is often considered as the best in class small dehumidifier- however, you need not take anyone’s word for it. 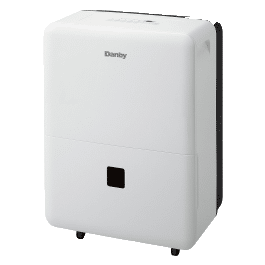 As you go through this DeLonghi DD50PE Dehumidifier review, you will learn about its features, functions, working, pros & cons, warranty and any other information that is important for making an informed choice. DeLonghi DD50PE Dehumidifier is a crawl-space dehumidifier. This 50-pint dehumidifier is amongst the most expensive models in its class, and this is obvious from its design and built. The construction is done using the most premium of materials that ensures high quality and longevity. The hardware of the dehumidifier is well-integrated with all the functionality that it offers, as you will discover by reading ahead. Delonghi DD50PE gives its users a number of features, the major ones from which are highlighted below. One of the biggest selling points of the this model, as claimed by Delonghi, is the patented pump system that it employs. With this, the unit can discharge moisture continuously without the need of emptying a bucket repeatedly. Apart from the pump system, the unit offers two different ways to drain water, thus allowing you greater flexibility to drain the way you want. One of the prime features that Delonghi gives with this model is its energy saving features. The model is Energy Star qualified and has the R410A eco-friendly refrigerant. Along with electronic controls, you can set the dehumidifier to the exact settings that you want with ease. The LCD display lets you keep a track of the settings at which it is operating, including the set humidity level. This 50-pint dehumidifier offers a very low noise output, with a maximum at 10 feet when on high fan speed being 53.6 dB. 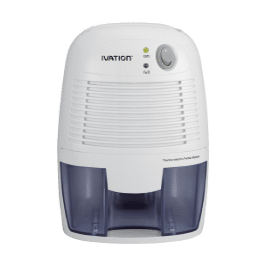 As compared to most humidifiers in the market, the Delonghi 50-pint dehumidifier comes with a pump, which means that you do not need any additional equipment, not even a hose, to setup the drainage. However, as opposed to the standard of having the drain port on the unit’s back, this particular model has the port at the front of the unit. That does not really cause any problems with its operation- and with three different drainage options- continuous drainage with the pump, passively via the 3 included hose or through the tank directly (capacity- 6 liters), you get a range of flexibility. There is no work required for setting the dehumidifier up, and all required attachments/equipments are provided in the box. Using it is simple, with the electronic controls and LCD display allowing you to set it just the way you want. Monitoring the water level and keeping everything else in check is simplified to the maximum extent, with only rinsing the washable air filter as required. The dehumidifier offers you a ‘worry-free’ operation, for it come with low-temperature operation up to 41F, anti-frost device and a tank control system with an alarm. 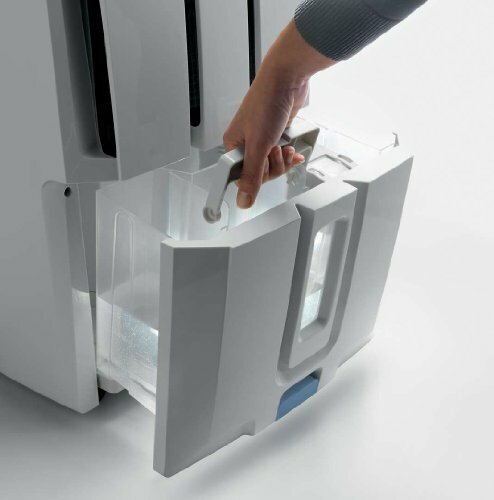 As mentioned earlier in this review, the DeLonghi DD50PE Dehumidifier lets you chose from 3 different drainage option as per your needs. Any attachments or accessories for using these options also come with the equipment and no extra purchase is needed. The unit helps you save on your energy bill, which is guaranteed by the Energy-Star qualification, coupled together with the eco-friendly R410A refrigerant. The energy efficiency offered by this unit is considered as the best for 50-pint dehumidifiers. You can run the dehumidifier continuously without any issues- just place it near a suitable place and the rest is taken care of. A major part of the durability of this product comes with the high quality of materials and construction that has been employed in making it. Limited range of operating temperature: The operational range of temperature for this device is quite limited, since it is a narrow range of 41F to 90F. Complicated settings input: While everything is clearly displayed, inputting the settings can be a little difficult for those with no experience with the equipment. Apart from the settings input, which could be a little complicated for some users, this model is overall easy to configure and use. Its LCD screen and precise controls ensure that the user has maximum control over how the unit operates and what results it gives. You can easily set it at the desired temperature/humidity level as per your requirements. 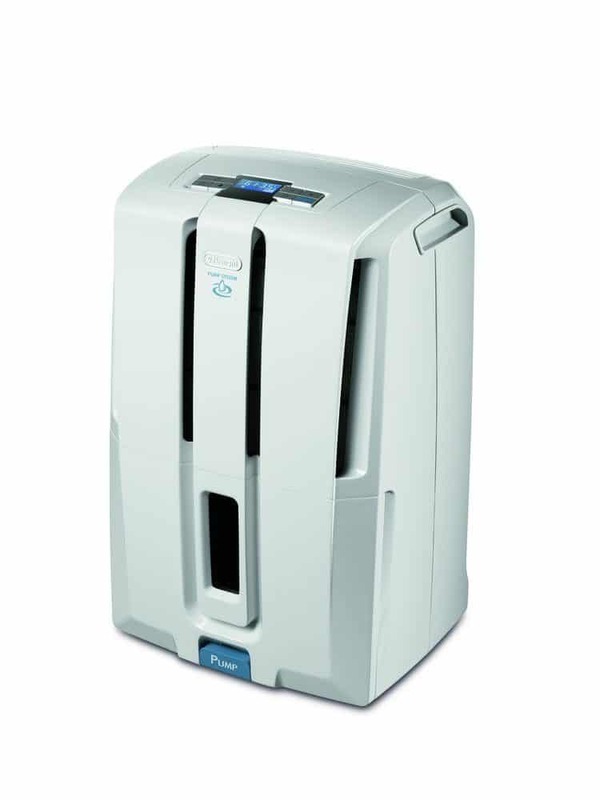 DeLonghi DD50PE Dehumidifier is amongst the heaviest 50-pint dehumidifiers in the market, having a weight of 40.1 lbs. To aid in moving it around, there are a set of rollers along with it, which means that one person can do the needful without too much difficulty. The unit does come with the Energy Start certification, and is amongst the most energy efficient 50-pin dehumidifiers in the market. It draws a power of 439 watts at 50% relative humidity, which is the best figure that any dehumidifier can offer you. However, as compared to a 70-pint model, this model does utilize greater power for each unit of humidity. From 1 year after the initial purchase date, the unit is free from any defects in workmanship and materials, with free labor and parts on the entire device if necessary. An additional 4 years of limited warranty is there on the sealed system, which covers the compressor, condenser, evaporator as well as the factory-connected refrigerant tubing. The consumer will pay for all other part and the labor during this period. 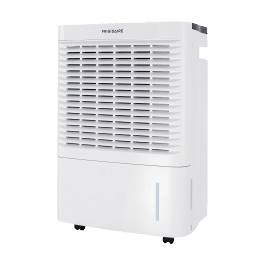 It should be noted here that the warranty is only valid provided that the dehumidifier is used as per the directions that come along with it. In case of any repair or replacement outside the factory, the warranty shall be void. Users can all their country’s respective toll-free numbers or log on to the website to get repairs. 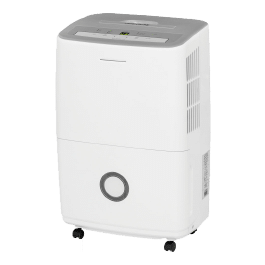 Thus, with everything that has been stated about DeLonghi DD50PE Dehumidifier in this review, it can be safely said that this model is worth the money you pay for it. While it is priced above most 50-pin dehumidifiers, it more than makes up for the cost difference with superior build and construction quality, energy efficiency and a range of other features. 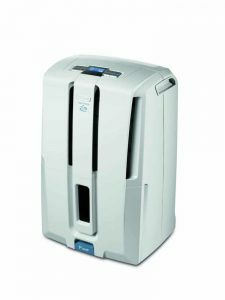 Any user who can spare the small price difference will surely love to have the DeLonghi DD50PE Dehumidifier. With all the information in this DeLonghi DD50PE Dehumidifier review, you will be able to decide if it will be the right product for you. A trusted name like DeLonghi is known for providing quality products in the market, and DeLonghi DD50PE does not disappoint by any chance. An informed decision while making a choice like this is surely the best way to get the most for your money! Q: What will happen in case a unit is working and there is a power-failure? A: In such a scenario, the unit will switch on itself when the power comes back. It will also retain its settings, which includes the target humidity and the pump mode, when switched on. Q: Does the model come with an ‘auto-off’ feature? A: In case the tank is full, then the unit will switch off automatically. This only happens if you are not using the drain line or the pump as an alternative drainage method. Q: How long can the dehumidifier work on continuous operation? A: As per user reviews, the dehumidifier has been used for well above 6 months of continuous operation without any issues. Only the appropriate drainage method needs to be accounted for before running it for a long period. Alaiazaam-informatkon found, problem solved, thanks!